similar to the 1350, the 60 is another quality pocket computer. well-built and quite competent. the 1360 has the luxury of two expansion slots compared to the 1350's single one. 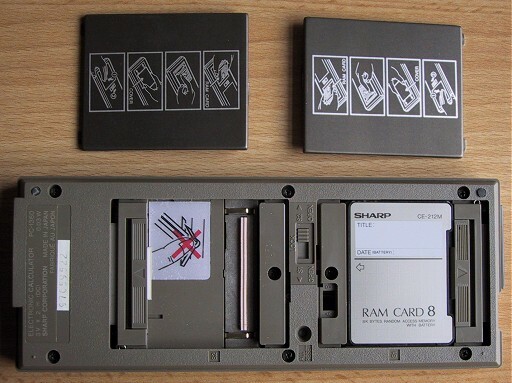 the cards for the 1360 are smaller, shown here the ce-212m has 8mb. a subtle difference to the 1350 is that the 1360 has no built-in memory (the 1350 has 5k) meaning that you have to have at least one slot populated. since the 8k comes with the machine, you still really only have one spare for expansion. one 8k card as shown yields around 6k of available program memory.